So on a car ride home I was thinking about making a spreadsheet for the FPL. I'm just an regular FPL participant, usually ranking around 500 - 1500 every time. But this time, I wanted to ingratiate the try-hardness in my soul. I actually sat down and looked the lineups. And so, I recorded all the prices, appearances (at least for week 1), and the Aligulac rating for each player. Now, Aligulac isn't perfect, but I personally think its a fair estimate for the caliber for each player. 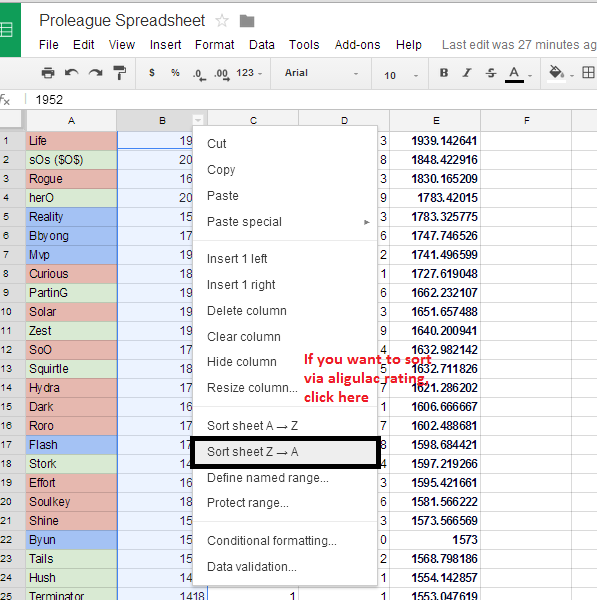 And so I finished the spreadsheet, but I'm only in high school, and my amateur skills as a high school student should tell you that I'm not proficient in Google Spreadsheets. And its evident when you see it. As most FPLers would dream, what if there was a rating system for the Proleague participants? I'm far from being the most experienced person to create a sufficient rating system, but my tryhard soul willed me to. I already had the data down, and I didn't have anything in particular to do on this Saturday afternoon. There is only logic, and a little bit of trial and error behind some excel formulas. I took about 10 players, all with varying Aligulac ratings, costs, and lineup appearances, and...used trial and error. I won't bother explaining it. I do weight lineup appearances a lot more than the rating and the cost. Because the maximum lineup appearances possible is 2, the rating system is far from sufficient. A player like Reality is definitely not 5th best out of all 80 or so participants in Proleague. But if you don't get placed in the lineup, you can't get points. And if you can't get points, you're not worth choosing. But someone can be placed in the lineup, and lose every time right? Yep. Which is why I should probably base it on Proleague wins, but I don't have anything to base that on. As time goes on, the ratings will make more sense. I know the ratings aren't valid, but its worth a shot. If anyone can come up with a legitimate FPL formula hmu and we'll rule together. I'll probably update the lineup appearances and pricing every week, if I'm not too lazy. I hope you factored lineup appearances with team appearances. Players on teams playing once in week 1 shouldn`t be undervalued much at all if they`re in 1/1 lineup. Thats a very valid point, and im surprised I didnt think of that. I'll see if I can solve that problem tomorrow morning.